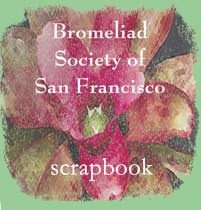 Here you will find pictures of BSSF activities as well as Photographs of plants brought into our monthly Show and Tell Table, bromeliads found in our and friends' gardens and collections and from members' trips. The web builder will add more genera and books as he assembles the fotos. If you know the ID of a plant we would like to know it too. Email Dan and let him know.